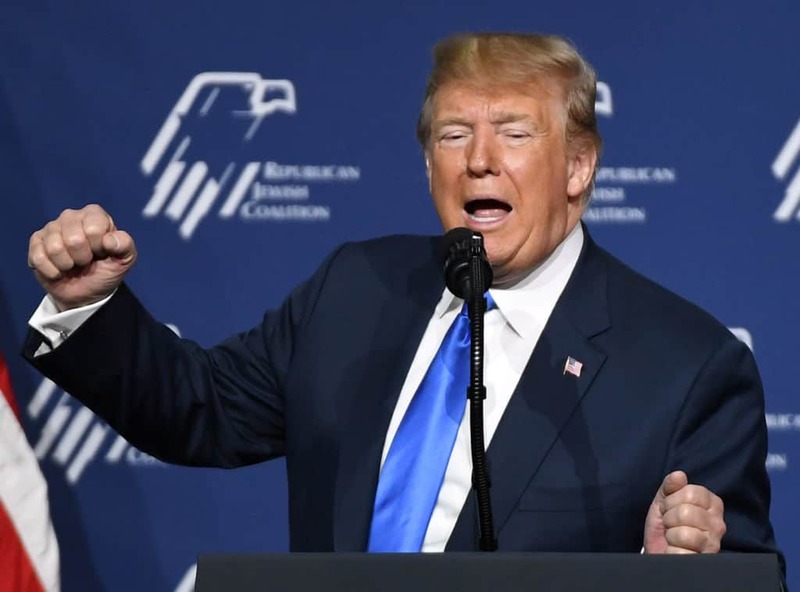 President Donald Trump gave a speech on Saturday to the Republican Jewish Coalition in Las Vegas, Nevada, during which he referred to Israel’s Prime Minister Benjamin Netanyahu as “your prime minister” to the group. Trump was called out for doing so by many users on social media, and for making other references toward the organization suggesting they held “dual loyalties” to American and Israeli interests. Such dual loyalty comments are seen as promoting an anti-Semitic trope, one that Trump himself condemned when he recently accused a Democratic lawmaker of doing the same thing. NYU History Professor Ruth Ben-Ghiat pointed out that Trump’s words were “dangerous,” and that he was in bad company alongside other infamous leaders who had utilized the dual loyalty trope in the past. In addition to using the word “your” to describe his association of Jewish Republicans with the Israeli state, Trump also described members of the organization as “Israelites” multiple times during his speech. Incredibly, Trump took time during his speech to deride Democrats, suggesting they didn’t have Israel’s interests at heart — doing so while again utilizing the dual loyalty anti-Semitic trope. “If implemented, the Democrats’ radical agenda would destroy our economy, cripple our country, and very well could leave Israel out there all by yourselves,” Trump said. Others on social media called out Trump’s seemingly anti-Semitic words and behavior. Last month, Trump took aim at Rep. Ilhan Omar, a Democrat from Minnesota, for her criticisms of American Jewish leaders and institutions supporting Israel. Critics of her commentaries suggested she was using the “dual loyalty” trope at the time as well, and the president was quick to join others in condemning her for it. The president even went so far as to suggest Omar should resign over her comments earlier this year. After Omar apologized for her words, Trump, during a Cabinet meeting in the White House, said, “I think she should either resign from Congress or she should certainly resign from the House Foreign Affairs Committee,” per reporting from CNN.